RIO DE JANEIRO — What track and field really needed was a Usain Bolt-like jolt to steer the conversation from the endless string of crime, punishment and doping that nearly sank the sport over the past year. 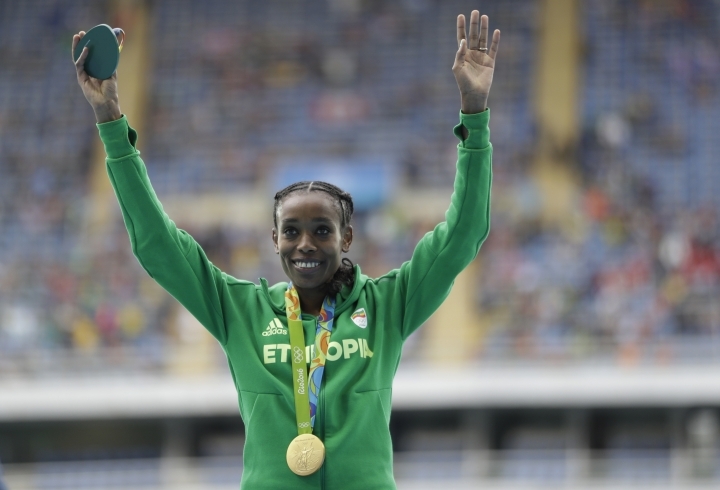 What it got was a 10,000-meter world record from an Ethiopian who considers it her second-favorite distance, and a race that will go down as one of the best ever run at the Olympics. 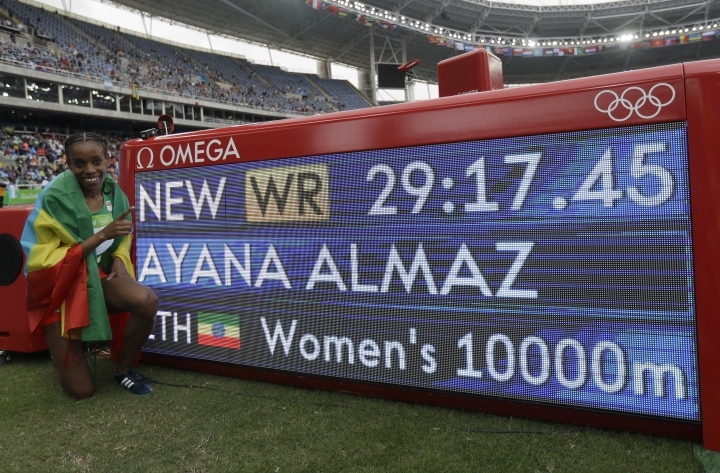 While Bolt was waiting in the wings for one more day, Almaz Ayana opened the Olympic track meet Friday by running the 10K in 29 minutes, 17.45 seconds to shatter a 23-year-old record by more than 14 seconds. "This was not my plan," Ayana said. It was quite an impressive race, even though the stands were maybe a quarter full when it happened. The 24-year-old Ayana, who had limited experience running 10Ks on tracks and is really considered a 5K specialist, won by more than 15 seconds. She was halfway through her victory lap while the largest pack in the field of 37 women was making its way across the finish line. Spurred on by her pace, 18 women ran lifetime bests. Eight national records were set, including one by American Molly Huddle, who finished sixth. 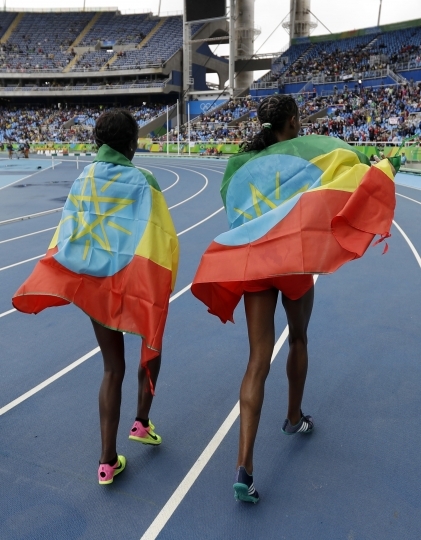 And silver medalist Vivian Cheruiyot, bronze medalist Tirunesh Dibaba and fourth-place finisher Alice Aprot Nawowuna recorded the third-, fourth- and fifth-fastest times in history, behind only the new record holder and the previous one, Wang Junxia of China. The confluence of fast times on a cool, rain-dampened track — perfect running weather — could help blunt the inevitable questions about how someone with little experience at the distance from a country that has spent its share of time under the doping microscope could shatter a generation-old record that, itself, is under heavy scrutiny. Wang's 1993 record broke the previous mark by nearly 42 seconds. Track's governing body, the IAAF, has been investigating claims that suggest Wang was part of a state-sponsored doping program in her country in the 1990s. Confronted with the improbability of her record, Ayana's answer was simple. "No. 1, I did my training, specifically in the 5 and 10," she said in comments translated to English. "My doping is Jesus. Otherwise, I'm crystal clear." In the night session, with the stands barely more packed than in the afternoon, came a different sort of surprise. 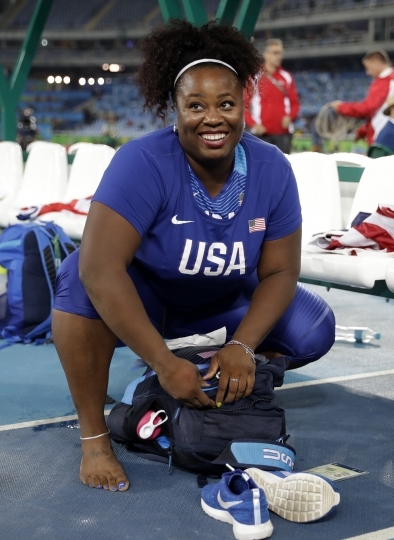 American Michelle Carter won the country's first medal since 1960 in women's shot put — and a gold one, at that — using her last throw of the night (20.63 meters) to beat two-time defending champion Valerie Adams of New Zealand. "It's tough, but it's sport. Sometimes you take one on the chin," Adams said. 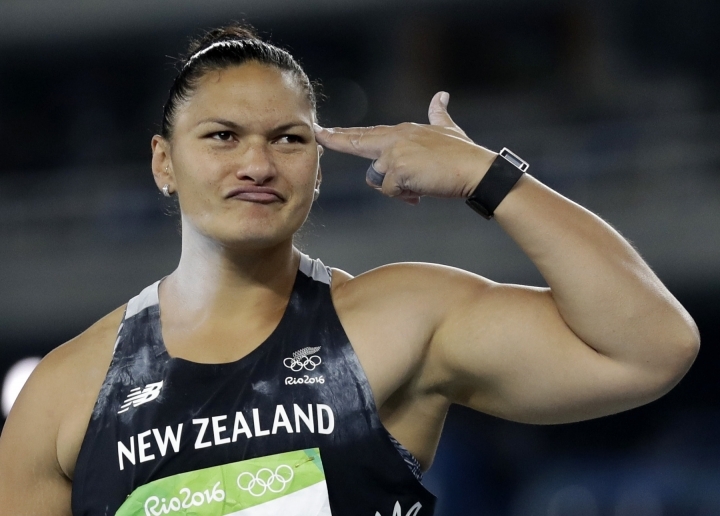 In the sprints, the expected list of women coasted through first-round heats at 100 meters. Two-time defending champion Shelly-Ann Fraser-Pryce of Jamaica led the way with a time of 10.96 seconds. Also still in the field are five women, including Americans Tori Bowie, Tianna Bartoletta and English Gardner, who have broken 10.8 this year. And, of course, no day in track and field would be complete without at least a bit of doping news. A Bulgarian steeplechase runner got booted from the Olympics a day before her scheduled race. Also, Kenyan 800-meter runner Ferguson Rotich showed up and made it through his round, two days after a coach borrowed his credential to grab something to eat in the athletes village, only to be met by doping-control officers who wanted to test Rotich. Rotich ended up being properly tested, but IOC spokesman Mark Adams said there were more questions to be asked. "This isn't over," Adams said. Nor is Ayana's Olympics. Next Friday, she'll run in her favorite race, the 5,000 meters, where she is the reigning world champion. "Not at all," she said when asked if the effort it took to break the 10K record could sap her strength for the 5. She made it look easy. Ayana took the lead from a Kenyan pacesetter at the midway point, then started building an insurmountable advantage over two of the most-decorated veterans in the game. Cheruiyot won world championships last year, and Dibaba was the two-time defending Olympic champion who skipped the 2015 season to have a baby. 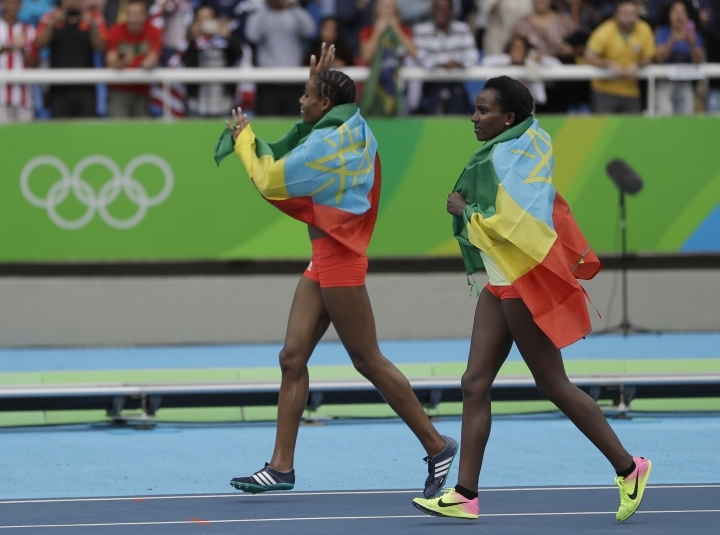 "Running with Dibaba gave me the energy," said Ayana, who frequently referenced her 31-year-old countrywoman as her "sister" and her "ancestor." Now, those greats will be looking up to her — and trying to catch her, too.